1949-51 Zippo advertising Larkwood Stockings. A graphic of a lady's stocking-covered legs and "3V's Vamp Top, Vamp Toe, Volu-metric Control"
1949-50 Zippo with a graphic of a cartoon chef known as the ‘Tappan Chef,’ or the ‘Little Chef,’ representing Tappan Stove Co. Tappan appliances was founded by W.J. Tappan as the Ohio Valley Foundry Company in Bellaire, Ohio, in 1881 selling cast-iron stoves door-to-door. The company relocated to Mansfield, Ohio in 1889 and was subsequently renamed several times. 1953 Zippo with a graphic of family for Dairy Lea Cooperative "direct from our farms to you"
1958 slim Zippo with a ferocious looking "Mrs. Inky"
1965 Zippo with a family reading and "FPS". Could the meaning be Family Planning Services, or something else?? 1965 Zippo with interesting personalization. 1968 Zippo depicting a striding giant with a truck in his hand advertises Holland Motor Express, Inc. - "You can't beat the Big Dutch Fleet"
1969 Zippo with a graphic of a walking man in a business suit with a hat and a walking stick. Peters, Griffin, Woodward, Inc. was a New York based advertising agency. 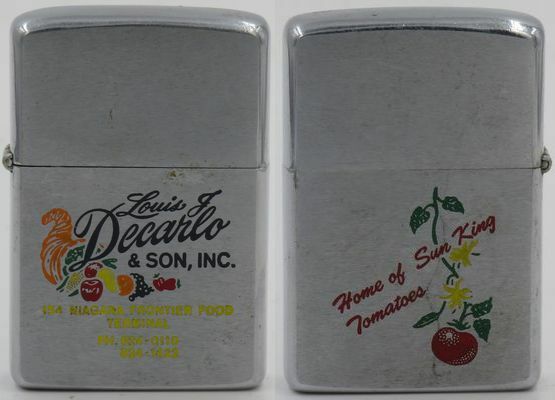 The personalized two-sided Happy Hangover Zippo below is from 1968. The "all around good fellow" Earl Armacost surely was much happier on Saturday nights than he was on Sunday mornings! 1991 Zippo on brass case with prototype design of "Billy" giving a two-finger salute.